About: There are many recipes for Shepherd's Pie. They range from using leftover roast leg of lamb with its pan gravy, carrots, peas and corn niblets which are topped with mashed potatoes and baked in an oven. A popular version uses ground beef browned with onions and celery. After browning the mixture is sprinkled with flour, water is added to create a sauce and mixed vegetables are added. It is then placed in a casserole and topped with mashed potatoes, cheddar cheese and baked in an oven. Other methods use cooked diced roast beef, diced steak or ground lamb. All are topped with mashed potatoes and baked. In France the dish called Hachis Parmentier and is usually made with lean ground beef browned with bacon, chopped garlic, shallots, onions, tomato, white wine and parsley. It is also topped with mashed potatoes and gruyere cheese and baked in an oven. Oh yes, in all cases the dishes are seasoned with salt and ground pepper. 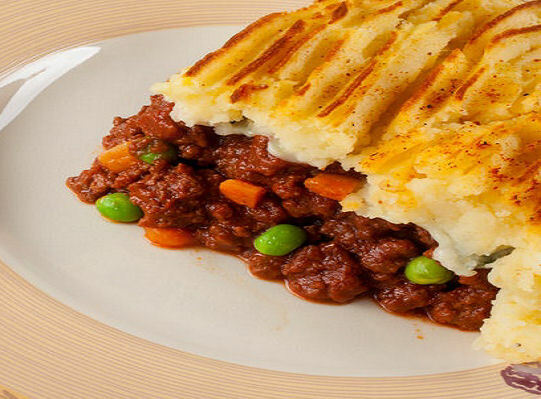 Basic recipe for Shepherd's Pie---(You may substitute any type of meat you like as mentioned above, I prefer using roast lamb that is diced in 1/4 inch pieces then browned and mixed with the other ingredients (including some lamb gravy that may have accompanied the roast lamb). I must say that lean ground beef does make a very good Pie. Make your favorite mashed potatoes and keep them warm. Grate the cheese and pre-heat the oven to 400 degrees F.
In a hot skillet, add the vegetable oil, then brown the meat with the garlic, shallots and onions. When browned and the vegetables are tender, add the salt, pepper and flour. Cook for 3-4 minutes over medium heat, stirring often. Add the tomato paste, beef or chicken broth and cook until the mixture becomes thick and creamy. (If you like a thinner sauce just add a little more broth). Now add the peas, (Other vegetable combinations if you like) and parsley. Taste the mixture and add more salt and pepper if you like. Place in a casserole dish and top evenly with the warm mashed potatoes or use a star-tip and pastry bag to pipe a decortive pattern and top off with grated cheese. Bake for twenty minutes or until golden brown. Serve with a crisp salad, hearty Irish oat bread and beverage of your choice---Enjoy!!! Double the recipe and prepare individual pies in individual aluminum baking pans that you can buy at most markets. Assemble the pies ad freeze them for later use---don't bake this until you take them from the freezer. When you do, let them defrost for at lease 4 hours before you plan on baking and then eating them!